My first real pattern! I made these for Kelly for Christmas. They're really warm and really soft. These look very cool...oops i meant warm. I will put these on the "to do" list. Thanks for sharing the pattern. This is a GREAT pattern! Thanks so much for the free download. I posted my version (just shorter) on my blog's entry from 2/16/05 with a link to this post of yours. Thanks again! Thanks for sharing the pattern. I think I'm going to make these to keep my hands warm while I work on the computer! Thanks for being so generous with your talent! I ABSOLUTELY ADORE this pattern. 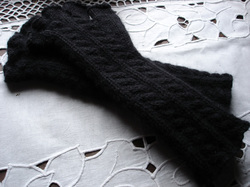 I have done it now 4 times (4 mitts, lol, not 4 pairs) and I love it, love it. Thank you for posting the pattern. I have some friends at my knitter's nite whom loved it and had to have copies of it too. I just made my last pair with LB Cotton-Ease. Once again, thank you :). By the way, I LOVE your highlights!